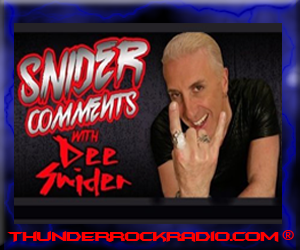 Snider Comments with Dee Snider is a weekly pulling back of the curtain on the rock world and exposing of oft-unmentionable truths. With his rock icon pedigree and more than 20 years in radio and television broadcasting, Dee Snider has never been afraid to speak his mind and call 'em as he sees 'em. Filled with straight talk, interviews and listener interaction, Snider Comments will make sure the world of rock and roll is never the same. Join us on Wednesday nights at 8 pm Eastern on ThunderRockRadio®.